Yesterday The Wall Street Journal web site had a story about the big gaming companies moving from subscription to free-to-play models for MMOs (no subscription required to access the story, at least for now). The event that triggered the story? SOE's move to make a F2P service for EverQuest 2. So it isn't just the EQ2 player base or MMO bloggers paying attention to the story. Last week I wrote a post mentioning that the expansions for Eve Online on the Serenity server, the one Chinese players play on, lag by several months. But Eve is not the only Western MMO in which this occurs. Last Friday, the People's Republic's General Administration of Press and Publication (GAPP) reportedly approved Blizzard's Wrath of the Lich King expansion for World of Warcraft for release in the PRC, although the game still needs approval from the Ministry of Culture. 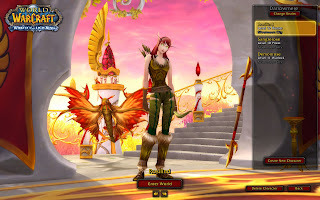 The expansion could finally hit the Chinese market as early as August, or 22 months after the original release of WotLK on 13 November 2008. Unlike Eve, WoW got caught up in bureaucratic in-fighting between two government agencies. I guess being an Icelandic company has its advantages. Well, and CCP developing DUST 514 in Shanghai probably doesn't hurt either. I've been behind the times following Curt Schilling's 38 Studios until I ran across an article in which he is moving his company's operations from Massachusetts to Rhode Island. I didn't know that the company actually was about to launch a product, although Project Copernicus still seems a long way off. The details are in the video clip below. I'm not really sure how I feel about SOE's announcement that EverQuest 2 is opening up Free To Play (F2P) servers. The one thing I can say is that if a player like myself wants to have all the crafting classes on one account, it is a lot cheaper to purchase the F2P Platinum plan ($200/year) than to pay for a Station Access account ($30/month, or $360/year). I'll be interested to see if SOE adds 2-3 slots to a regular EQ2 account. If they do, then EQ2 is attractive to me again. Of course, I could wait until the population base on the subscription servers becomes small enough that they are merged onto the F2P servers. Why would I think that? Because the 14-day free trial is going to be cancelled and I think most new players will start on the F2P servers. Interesting times are ahead for my former gaming home for 3 1/2 years. While I was doing research into Eve Online's China server, I ran into another article about in-game economies, this time from the Wall Street Journal. But unlike other articles I've read, I learned that CCP shares its database with the Helsinki Institute for Information Technology’s (HIIT) Social Media research group, for example, and collaborates with Magnus Thor Torfason from Columbia University’s Business School. The article also mentions the University of Southern California's (and Terra Nova contributor) Dmitri Williams, who has done work with over 60 terabytes of log files from EverQuest 2 that SOE made available. I'm actually thinking about buying the mp3 from a conference that was held in Chicago that discussed some of the work. Given the recent flap over Activision/Blizzard's planned use of ReadId on the World of Warcraft forums, I wonder what the player base of Eve Online thinks about the sharing of their economic information? 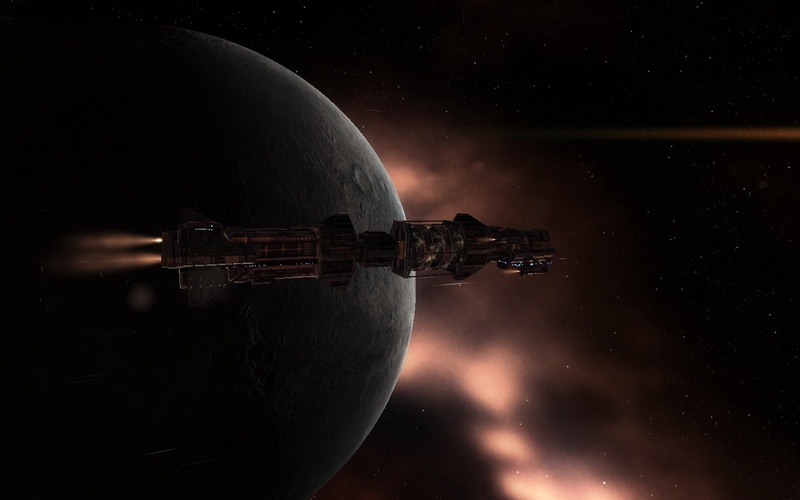 I was surfing the net and came across a press release by a company called CDC touting a 25% increase in revenues since the launch of Eve Online's Apocrapha expansion on 16 June 2010. My first reaction was, WTF? Then I read a little further and realized I was reading about China and Eve's Serenity server. So I decided to do a little research. In 2006, CCP partnered with Optic Communications to open a server in China called Serenity. In June 2007, Optic was acquired by CDC, which also owns the China publishing rights to Lord of the Rings Online. From what I can tell, CCP first produces expansions for the western market, and then localizes Eve for the Serenity server. To give an idea how far behind the deployment curve the game in China may be, the Quantum Rise expansion was released on Serenity on 7 January 2009. The name of the expansion on Serenity is actually "Wormhole", and I've gotten a kick out of how Google translates "Sleepers" into "who hibernate". From the little poking around I've done, Serenity is currently experiencing a live event. But instead of a Sansha invasion, the Sleepers have been let loose from their wormholes. The two eyewitness reports were a bit difficult to read, but I think the Chinese are having as much difficulty with their invasion as TQ is having with its own. I'm interested in what happens on Serenity and finding out more about the Chinese server. I'd really like to see the head of CCP's in-game economy department CCP Dr.EyjoG (a.k.a. Dr. Eyjólfur Guðmundsson) do a comparison between Tranquility and Serenity. The comparisons might not be valid since the two game worlds operate running different expansions, but seeing how players from China react compared to their western counterparts would be interesting. Once again I'm flying across the pond for work. But unlike last time, I actually have some posts written and queued up for release while I'm away. And I won't announce the blog is closed when I get back. When I played World of Warcraft 4 years ago I played a protection paladin, got nerfed horribly, and managed to get to the then level cap of 60. So I guess it was natural I would roll up another paladin and see how the class has changed. I named her Panzerrose and, like my first pally, is a miner and blacksmith. I actually joined a group with her and I don't think I did too badly. As I remembered from my first time in WoW, the armor can really clash and look bad. For now, I'll post this screenshot of Panzerrose at level 10. She actually looks better than she did at level 9 because I was able to make some armor that not only improved her stats but looks a lot better. Right now she has no personality because nothing has really happened to her. We'll see what happens in a few weeks. But I know she is not going to become a fashionista. Blizzard just won't let her. Kirith has finally done it and gone solo with his podcast segment, Broadcasts from the Ninveah. As always I wait until the 5th episode to judge a podcast, but I'm really interested to hear how he'll do and what direction his podcast will take. One thing I'd like to hear is how he does his research into ships. If you have never read his ship write-ups for the Eve Tribune, then I suggest going to his blog, Innner Sanctum of the Ninveah and downloading his Project Athena. I used one of his builds for the Bellicose in the ship I flew for my only kills. One thing I'd recommend to any new podcaster is to go over to Virgin Worlds and watch episodes 2 & 3 of Brent's Other Podcast. The shows have some good tips on recording equipment. Just a brief note on what I did in Eve Online over the weekend. With Hulkageddon 3 leading lots of outlaws into high-sec, I decided to practice my tackling. So I camped a couple of gates and tried to tackle the pirates as they flew past on their way to gank exhumers and mining barges. The result? I failed miserably. I only manged to tackle one destroyer and I never managed to get a lock on a pod. Oh well, I guess I need more practice and maybe need to use a better ship than a Rifter. Maybe I'll buy a Jaguar and put something good in the fourth mid-slot. Just because I have started playing World of Warcraft doesn't mean I have abandoned Eve Online. Far from it. I've been engaging in a grind for faction with Core Complexion, a Minmatar NPC corporation that is located throughout New Eden. Rosewalker, my combat pilot, is up to 7.30, which means he will soon be able to acquire jump clones from the corp. Wandering Rose, my industrial/economic pilot, is now up to 5.68, or just one more faction point away from having perfect refine in Core Complexion stations. Last night I reached a milestone: 200 million isk. That was the goal I set in order to buy Wandering Rose a new ship. So I headed out to Rens and bought a Prowler. This is a ship I've had my eye on since I first started thinking about running cargo through low-sec. Okay, the ship has the lowest cargo capacity of the blockade runners, but does have two high slots which comes in handy when hauling in wormholes. I've had that phobia about being in a wormhole without a probe launcher ever since that POS takedown I participated in when I was in Eve University. I probably won't take my ship out for a week or two. With Hulkageddon 3 starting, I don't want some trigger-happy ganker to mistake my ship for a mining hauler. I did something I thought I would never do again. I re-subscribed to World of Warcraft. Why? Because Brenlo did such a fine job of running EverQuest 2 before he was fired that returning right now just isn't attractive. And I'm not even referring to the whole "rangers are fine" attitude the developers have. I gave up on that aspect of the game when the EQ2 devs fixed the rangers' mythical bow and the arrow mechanic by nerfing all level 1-70 bows. With my crafting addiction in full force, I have already created 3 characters. One thing I like about EQ2 over WoW is that in EQ2 a character can harvest everything. 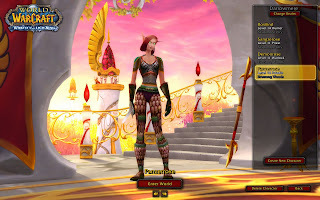 In WoW you get one or two gathering professions, and you have to raise your adventuring level in order to get past certain caps in your crafting levels. Also in WoW, you have to level up your character's adventuring level to get to be a high-level crafter. No level 8 ranger/level 80 woodworkers in Azeroth, gosh darn it. With that in mind, here is a quick introduction to my characters. 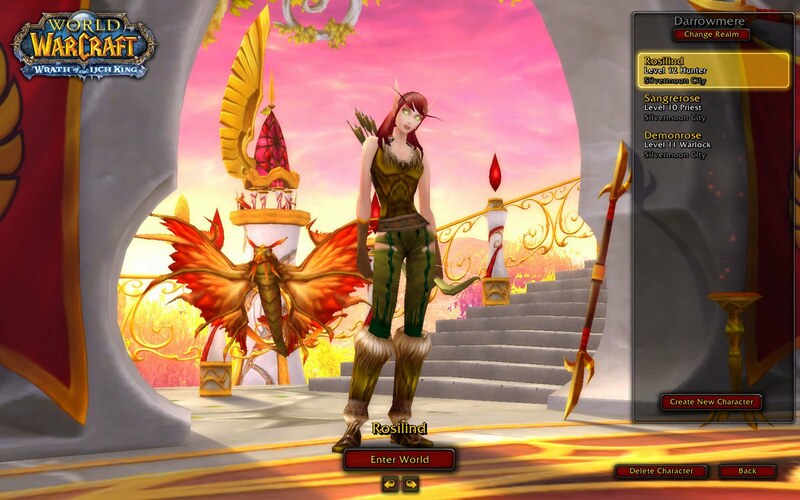 Rosilind - Rosilind is a blood-elf hunter. Yes, I am playing another ranged class in a race in which I think the female characters look tougher than the male characters. But the last time I played WoW I played on the Alliance side so this time I'm playing Horde. That perhaps was not a wise choice since I'm playing on Darrowmere and I understand that realm is dominated by the Alliance. We'll see. I'm up to level 12, tamed a Dragonhawk and named him Smokey. I'm really looking forward to having combat pets, which is something rangers in EQ2 don't get. Of course, that means I have to do some things like learn how to fish so I can feed my pets. But that is okay, since the fishing mechanic in WoW is more interesting than that in EQ2. And for the all-important crafting professions, Rosilind is a skinner/leatherworker. 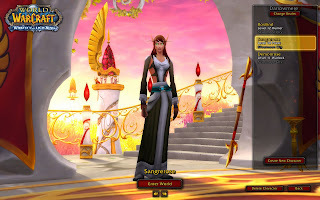 Sangrerose - Sangrerose is a blood-elf priest with a sassy attitude who managed to become involved in PvP on a carebear server at level 2. As Sangrerose was running around the newbie island as a level 2 priest, she was heading to a quest NPC and what did she find? A level 58 deathknight space goat camping the quest NPC. For those who don't know, all quest NPCs are flagged for PvP, which means that, even on a carebear server like Darrowmere, a much higher level NPC can prevent brand new players from progressing through the game. And with death being pretty meaningless, there is really nothing to stop a much higher level player from doing something like this except a large group of Horde players camping the offending Alliance player. Did I forget to mention Darrowmere is dominated by the Alliance? We saw a level 71 come in and kill the space goat, but that was it. Once the hero Horde player left, the space goat returned. Sangrerose managed to get killed 3 times while fighting the deathknight. A level 2 priest fighting a level 58? Well, all I could really do is taunt the Alliance player, clucking at the space goat and flapping my arms like a chicken, laugh at the thing and even fart on it. I forgot that clicking on the character attacks him, so the deathknight immediately saw this and one-shotted me. Then I rezzed at the graveyard and ran back. Bad move. I didn't realize I was flagged for PvP for 5 minutes, so the space goat one-shotted me again. When our own deathknight showed up I buffed him and healed him in the battle. Okay, not much healing, but I tried. Then our deathknight left. The space goat showed back up when I had 30 seconds left on my PvP flag. Death #3 ensued. Sangrerose is a tailor/enchanter. I understand that is a good combination, especially since blood-elves get +10 to enchanting. I'm a little worried that Sangrerose won't be able to harvest her own cloth, but that's what dps classes like hunters and warlocks are for. Right now she is level 10 and very popular. Well, at least from all the invites to guilds she's getting. Demonrose - Demonrose is a blood-elf warlock who takes too many risks. I'm at level 11 and I have already died 3 times. I guess partially that is because I'm still learning to play the class and partially because I took a bad chance and was overwhelmed, dieing twice to accomplish an objective and loot the boss' corpse. The person who first introduced me to WoW played a warlock as his main, and now I know why. Pure dps, although having played a ranger in EQ2 for 3 1/2 years I'm pretty aware of aggro so I've been using a lot of DoT (damage over time) spells. Now I just have to learn to be more careful until I get a pet that can tank better than an imp. Although the imp is pretty amusing, saying things like "this wasn't in my contract" and "is this really necessary". For crafting, Demonrose is a herbalist/alchemist. At first I thought that maybe Demonrose was better off being a tailor, but with all the dead bodies I've been leaving around while picking herbs, I'm glad I'm using a character with a lot of fire power. If I were really serious about WoW, I would dual-box while doing my gathering, with the second account running a skinner to clean up after her. One other thing you may have noticed. I did include screenshots. 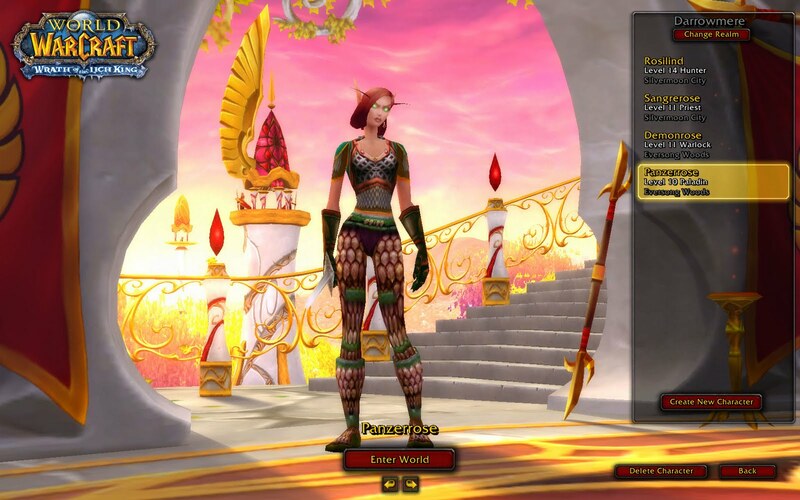 After my first experience in WoW in which I had a paladin in grossly mismatched gear, I really want to document just how good (or bad) the gear looks as I progress in levels. So far, so good. I've decided to start writing on this blog again. I learned a few things with the other blog, but that format doesn't quite fit what I want, so I'll just revamp this blog. Besides, this feels more like home.